A big, green snake slithers up your body, squeezing your rib cage, but you’re not afraid. It’s strangely exhilarating. In this virtual reality simulation, the snake isn’t real but the feeling in your chest is. In addition to seeing the snake through a virtual reality headset strapped to your face, you’re wearing a jacket filled with airbags that mimics the pressure and vibrations of a serpent moving across your body. The Force Jacket is meant to give a heightened sensation that goes beyond playing a video game or watching a movie. This special jacket is being developed by researchers at Disney to help take the VR experience to another level at a time when the adoption rate has been slow. Connected to computer software that controls a series of inflatable compartments, the Force Jacket can reproduce a variety of sensations, adding new kinds of perception and depth to VR. In collaboration with researchers at MIT Media Lab and Carnegie Melon University, Disney hopes the jacket can augment VR experiences typically limited to visual displays seen through headset and simple hand vibrations felt through joysticks. “The primary motivation of this research was to enhance the entertainment value of [headmounted display]-based visual VR experiences in games and movies, by providing on-body force feedback,” the researchers wrote in a paper published Wednesday. The Force Jacket contains 26 inflatable compartments which can reproduce more than a dozen “feel affects,” such as a hug, a punch, or a snake slithering across your body. These sensations are created by modifying the speed, force and duration of inflating or deflating the airbags. The pressure and vibrations can also correspond with visual displays, allowing users to feel the actions they perform and witness in a VR game. 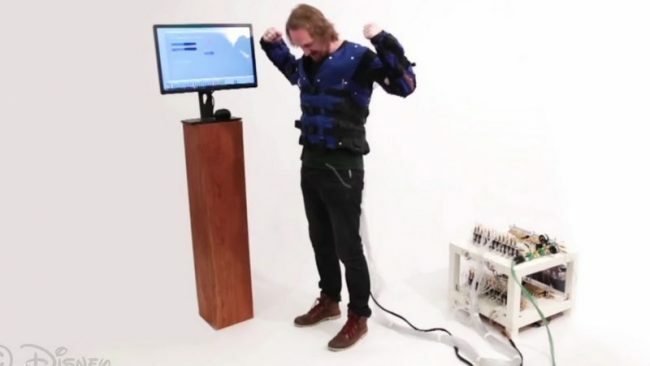 The researchers developed three prototype VR simulations to showcase the jacket. One placed a person in a snow-covered front lawn in the middle of a snowball fight, another allowed users to feel a “friendly” cartoon snake slither up their torso and squeeze their chest. The third simulation puts the user’s avatar shirtless in a bathroom, as they see and feel their bodies transform into a “muscular hero,” as their arms bulge like a bodybuilder’s. The Force Jacket’s vest was made out of a re-purposed life vest, with the flotation foam removed, the researchers said. The total weight, including tubes and airbags is 5 pounds. The sleeves can adjust to fit different body types. And Velcro is used to secure the jacket in place. While Hollywood and game industry investors have dedicated hundreds of millions of dollars to advance virtual reality technology, pulling in top talent and sparking a creative explosion, VR has yet to achieve popular acceptance or significant commercial success. Only 6.4 million VR headsets have been sold worldwide according to estimates, a figure dwarfed by the total pool of worldwide gamers of 2.6 billion people. That disparity suggests that even among individuals inclined to purchase a headset, few have chosen to pay up. Developers pin the slow adoption of VR on a multitude of factors: the high cost of headsets, which run $400 (roughly Rs. 26,700) or more; the initial awkwardness and disorientation of moving through virtual space; and more fundamental hang-ups over the creation of a new medium and what value it offers to consumers. VR also faces a crucial marketing dilemma. Like advertising a colour television on black-and-white TVs, existing media can’t convey the experience in full effect. With VR, consumers are hesitant, experts say. Nonetheless, engineers and developers are forging ahead.